Nearly all of Flathead Lake was covered in ice during the first week of March. This photo was taken on March 2. 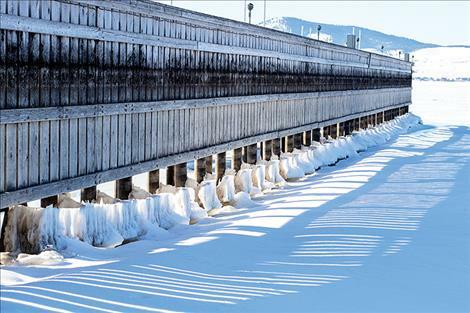 POLSON – Sequential cold fronts and low wind created an anomaly during the first week of March: 90 to 95 percent of Flathead Lake’s surface froze. Aside from a few open channels in the narrows outside of Polson Bay, the lake froze shore to shore. 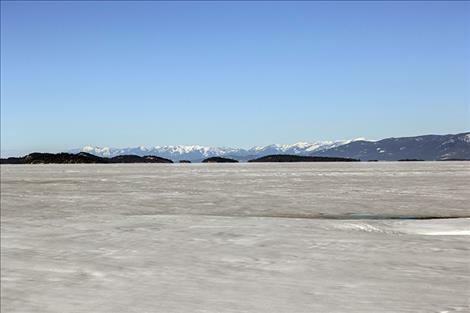 Flathead Lake Biological Station Research Scientist Jim Craft said the lake reached its peak ice cover on Tuesday, March 5. Craft said the freezing can be attributed to four sequential cold fronts the area experienced at the end of February and beginning of March. The last and most intense of the fronts brought temperatures at the lake to 20 below zero for three nights in a row. “The lake couldn’t quite handle it so it froze,” Craft said. One week later, 70 percent of the surface was still frozen. “We just haven’t had much wind,” he said. 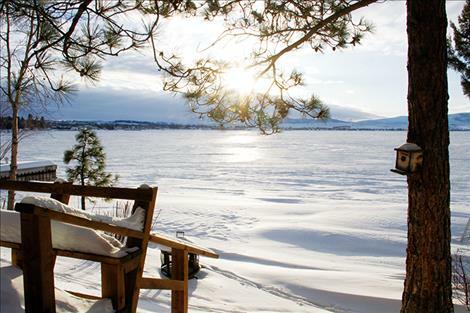 Polson Bay freezes nearly every winter, Craft said. Yellow Bay freezes 50-70 percent of the time. The bays are shallower than the open water, so they freeze more frequently. Outside the bays, it takes extremely low temperatures to freeze the lake. This is because it takes extended periods of cold to cool the large volume of lake water to the point where it will freeze at the surface. The lake is 370 feet deep at its deepest point. According to Craft, the last time all 191 square miles of the lake’s surface froze completely was in 1989. That year, the lake was frozen from early February to early April. Ninety percent of the lake froze in 1993. Craft said the freeze wouldn’t have a long-term effect on the temperature of the lake, and the organisms living in the lake aren’t affected by the freeze. According to Craft, the lake is more likely to freeze due to late-winter cold fronts. Later in the winter, the lake’s overall temperature is closer to freezing, so a few cold nights can cause it to freeze. Craft predicted the ice would break up starting in the existing channels and at the north end of the lake where the Flathead River enters the body of water. With warm temperatures forecasted, the ice would likely melt quickly. Craft said the ice made it hard for him to get out to monitor the lake. It also might impede spring recreation on the lake if it sticks around. “Hopefully it’ll be gone soon. Mack Days is starting and they’re not going to get any fish if this ice doesn’t leave,” he said.